Triton Bay lies south of Raja Ampat and is one of Indonesia’s greatest diving destinations which is still being explored. Jimmy Thai from Triton Bay Divers explains what makes diving the area magical. [0:00:05.8] CM: Hello and welcome to Dive Happy, the podcast about the best scuba diving in Asia, this is a very special edition of Dive Happy as it’s coming live to you from Triton Bay and I’m joined by Jimmy Thai from Triton Bay Divers. [0:00:20.6] JT: Hi, thanks for having me. [0:00:22.8] CM: Jimmy, I know we’re floating right in the middle of it but can you tell me, for listeners, where Triton Bay is located and if it really is called Triton Bay? [0:00:32.5] JT: It is called Triton Bay. The locals will pronounce it “Tree-ton Bay”. We are in the west Indonesian province of West Papua and we’re, if you’re looking at the map of Papua New Guinea in West Papua and Bird’s Head Seascape, the Raja Ampat would be near the head, we would be around the throat area of Bird’s Head Seascape. [0:00:52.1] CM: I’ve never had anyone refer to it like that. That’s a very good analogy. Yeah, the throat area. How long has Triton Bay Divers been in operation? [0:00:59.7] JT: We’ve just hit our two year anniversary a few weeks ago. [0:01:03.3] CM: Congratulations. Are you the first resort in this area? [0:01:06.8] JT: Yeah, we’re the first and only still. [0:01:09.2] CM: Okay. Given that this is still a very remote area, it’s hard to access in most space, in the nearest airport its Kaimana correct? [0:01:18.5] CM: What was it that inspired you to build a resort here? I mean, there’s easier ways to make a living than building a resort out here. [0:01:26.3] JT: Well, I always wanted to do something diving related and I did a lot of research and Indonesia was the clear choice and you look at within Indonesia where the trends were going, everything was going eastward. If you look at what was going on in Indonesia, Raja Ampat had all this momentum and obviously I didn’t want to go to a place like Raja where there were a lot of liveaboards, a lot of resorts. You looked at what the other choices were and around the Bird’s Head Seascape, the choice was Cenderawasih and the other choice was Triton Bay. Cenderawasih really, besides the whale sharks, there’s not a lot of diving unless you wanted to do wrecks and the diving in Triton Bay, I realized, was really good. Very good. I realized that there were no resorts here and I thought it was a really good opportunity to do something. [0:02:12.5] CM: Okay, what does the Triton Bay diving resort currently consist of? How many people can be there at one time and what are the facilities like? [0:02:21.9] JT: We’re really quite small still, we can only, we only have six bungalows for guests. Really, maximum is about 12 people, it can probably fit three into a bungalow if we wanted to but that would be too many divers per dive guide. Probably 12 would be the maximum we should take. [0:02:38.1] CM: Okay. So you’re very keen on keeping the guide to diver ratio low. [0:02:42.8] JT: Yeah, right now, we don’t want to go more than four to one. Right now we’re about two to one, three to one. [0:02:47.4] CM: Okay. Do you have like champagne on tap and air con and so forth? [0:02:52.2] JT: No, we don’t compare to the high end liveaboards such as Damar, Dewi Nusantara, Arenui, or Amira. We’re quite basic but comfortable. It’s not very high end, about 2,000 euros a week, that’s what we charge. The bungalows have — they’re comfortable, but they’re not luxurious. [0:03:14.4] CM: You would have like an en suite bathroom? [0:03:16.0] JT: Yes you would have an en suite outdoor bathroom, outdoor shower. [0:03:20.9] CM: Big electric fans? [0:03:21.9] JT: Yup. Big electric fans. [0:03:23.8] CM: Are the bungalows built so they catch the natural breeze? Or is there no natural breeze? [0:03:27.7] JT: There is a breeze because they’re beach front bungalows, they face the ocean. So if you open the doors, they’re sliding doors, you open the doors, you’ll get a breeze from the ocean. [0:03:36.6] CM: Okay. Given that you’ve just had to second anniversary of operation, presumably you’ve been getting a lot of good feedback from the guests that stayed with you and have you had many repeat visitors already? [0:03:48.2] JT: Yeah, we’ve had a few repeats. I don’t know if you know Graham Abbot from Diving 4 Images. [0:03:53.6] JT: He’s done two trips and he’s done two groups with us and he’s made three trips. So we’ve seen him a few times in the last few years. He just finished a group with 12 people for two weeks and he took a group of eight divers in October last year for a whole month. So we’ve been working a lot with Graham. [0:04:12.0] JT: He’s been really good to us. [0:04:13.3] CM: How would you describe the diving in Triton Bay to someone that has never been here and has no real concept of what the diving is like here? It is quite different to well, pretty much, anywhere else I’ve dived. [0:04:25.3] JT: Yeah, it’s really for at the moment, Triton Bay is really like a niche location, I would say it’s probably not the best location for a beginner diver because they don’t really know what they’re looking at. The first thing you have to realize with Triton Bay is that, because of the nutrients that how rich it is in nutrients, the vis is quite poor, that’s the first thing you have to realize. If you can overcome that then you realize that all the stuff in the water actually feeds the coral and that’s why we have such bountiful soft coral. That’s why there’s so much fish. So it’s a give and take that’s why there’s so much life. 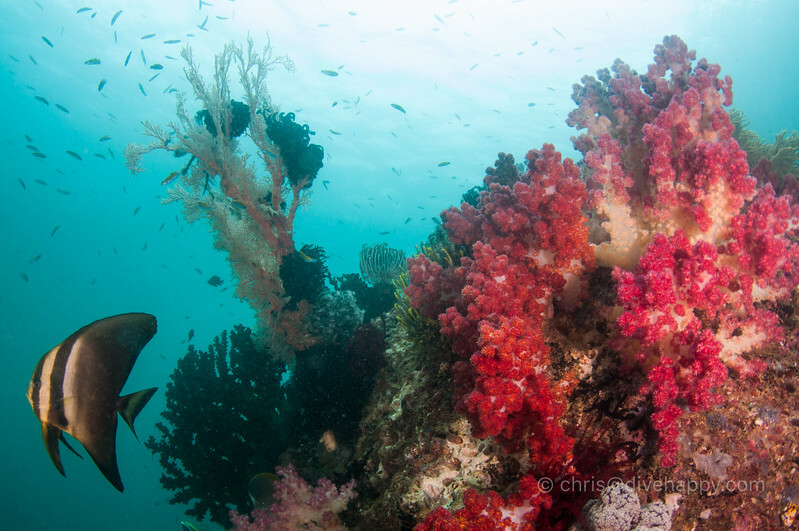 The reefs are full of life but the vis is going to suffer because of that. You’re not going to have 40 meter vis like you do in Thailand, but you’re going to have a lot more fish and a lot more coral. [0:05:07.4] CM: Right, I think that’s a very succinct summary of it. In fact, I’ve just been diving this afternoon in Triton Bay. [0:05:13.8] JT: It’s your first time here? [0:05:14.8] CM: This is my second time here but the first time was nine years ago so I barely remember it, to be honest. [0:05:19.4] JT: You were one of the pioneers here actually? Nine years. [0:05:22.2] CM: Yeah, I’m not sure about that but certainly, I remember the first time I dived here, it was quite a shock in a sense and it was a real — for me, it was a real education in precise about what you just pointed out, that if you had bad visibility, it’s actually a good thing because it makes everything outsize the fish and the coral. Tim Rock, the photographer, I remember he described Triton Bay as Raja Ampat on steroids and that kind of does seem to be the feeling of it. Today we’ve had two lovely divers and obviously everyone was thinking, “Oh, the vis is not going to be so good.” But it was, like you say, it’s never going to be 40 meters but it was pretty nice. Particularly when you go down to 10 or 12 meters. It felt weirdly like cold water diving even though it’s tropical temperatures. [0:06:08.1] JT: Yeah, we always say to our guests, “What do you want to do? If you want to do macro, we can do macro on almost any site. If you want to do wide angle, there are some sites that are just incredible but you really want to be five to seven meters where the light is good. So you can’t do wide angle at 20 meters, but if you go to Little Komodo, for instance, one of our best known dive sites, like five or seven meters, it is just stunning. [0:06:34.6] CM: Given the resort’s location, does that give you sort of pretty huge flexibility about where you go each day? You can go to pretty much any site you want in the area? [0:06:43.7] JT: Yeah, because we’re not quite in the middle of the island of Aiduma, we’re not quite in the middle but we’re sort of a bit north. It’s really close to the better known dive sites like Little Komodo and Bo’s Rainbow and we’re only 20 minutes away from the southern dive sites. Yeah, we do have a pretty good location. [0:07:00.1] CM: Excellent. While we’ve been here on Damai, there’s been talk about that there are now — I don’t know, maybe they’ve been here all the time? There are bagans just like in Cenderawasih Bay, which have started attracting whale sharks. Is that something that’s just been here forever or is that a fairly recent thing? [0:07:16.2] JT: No, it’s been happening for as long as I’ve known about Triton Bay. My first source of information about this area was Diving Indonesia’s Bird’s Head Seascape book by Burt Jones and Maurine Shimlock. [0:07:41.4] CM: Do they have photos in the book? I can’t remember. [0:07:43.7] JT: They have photos, they have a photo of a whale shark but I don’t know where that was taken. [0:07:47.7] CM: It’s a generic whale shark. [0:07:49.0] JT: It could have been Cenderawasih. [0:07:51.0] JT: Even back then when they published the book they knew about it. It has been going on it for a while. I don’t’ know exactly how long they’ve been doing it, but it has been going on a while. It’s definitely not something that the divers brought along or invented or encouraged, it happened even before the divers came by. [0:08:09.4] CM: Is that the sort of thing that you go to every week or whatever for the guests? [0:08:13.8] JT: Yeah, okay so, the first season we were pretty successful with the whale sharks sightings and then the second season, it’s almost completely lost to us for whale sharks because we had problems, there were a lot of problems with the village, Mai-Mai, that was really close to the bagans. The bagans in the water are controlled by Mai-Mai. There were problems with that village. We lost the second season to whale sharks. So we almost saw nothing and then this is now the third season and the problems have been solved. We are seeing whale sharks on a pretty consistent basis. Probably 70, 80% of the time now. [0:08:48.9] CM: Wow, I didn’t realize it would be — that’s such a high success rate. [0:08:53.5] JT: It started off traditionally the whale sharks are only in the northern bagans near Mai-Mai, but within the last few months, since like December-November, we’ve been seeing them at the south bagans by Namatota. That’s really helped our odds of seeing the whale sharks because we have a lot of bagans we can choose from. If you visit like 10, 15 bagans, there’s a chance that somebody’s got it. The last two, three months, we’ve been doing really well. [0:09:21.7] CM: How does the whale shark experience typically run? I mean, presumably the vis is not that great or is it like say five meters? Are you going to see it before it’s on top of you or, how does it work? [0:09:32.8] JT: Yeah, the vis is about five meters. We know they’re there, you’ll see them in the water. The best way to shoot them is to go near the nets where they’re being fed, where they fed the anchovies. If you just hang out there, they come. They circle and they come and they dive a little bit and they come back. They’ll stay as long as there’s fish. So as long as the bagan has anchovies to feed them, the whale sharks stay for two, three, four hours. The fish is still there. Obviously, when they run out of fish, the whale shark will start to lose interest but they will stick around for a long time. We’ve had whale sharks for more than two hours. [0:10:07.9] JT: Yeah and it’s a really, really passive, relaxed interaction and I think it’s unique to Indonesia because I don’t know anywhere else you can just stay in the water in one place and just have the whale shark come to you. I don’t know if you get that in Mexico or the Philippines but it might be an experience that’s unique to Indonesia. [0:10:29.5] CM: With the whale sharks actually and with Triton Bay in general, is it seasonal? Does the resort shut down for anytime of the year? [0:10:36.7] JT: Yeah because of the weather patterns of the northern summer months June, July, August, September, it’s very windy. The winds really pick up and it makes travel really dangerous because of the big waves and so that’s when we shut down. [0:10:49.9] JT: But the whale sharks are there, the whale sharks are here all year round. The whale sharks are always here but it’s tracking data from conservation internationally shown that they are here all year round however the bagans might not be operating because of the winds and we’re closed. [0:11:04.9] CM: Yeah but during the eight months that the resort is open and obviously liveaboards are visiting here then it’s fairly lightly that if you go to the bagans, you might see a whale shark. [0:11:15.0] JT: Yeah and I would just say that just to make sure that you are willing to pay a locals. If you are willing to pay the locals for the fish and whatever they ask, I think you won’t run into any problems. [0:11:25.2] CM: Foods that you’ve mentioned already that having some issues with the local village, how in general was the resort interact with other villagers in the area? Because the whole Triton Bay as quite broken up into separate families controlling different areas and stuff. So have you’ve got a good relationship with all of those different families or is there an endless tapestry? [0:11:44.4] JT: We have a very good relationship with the family from Namatota that owns most of this island, the island of Aiduma, and most of our dive sights are around here. We have a really good relationship with them. They’re actually partners in their business and so they were given a smaller number of shares in the company and so we work with them very closely. They are always around so we have no issues with them at all. When we go down south to dive sites such as Dramai, we end up paying a little bit to the family there and when we go to Mai-Mai to see the whale sharks, we pay a little bit there as well. But generally around the resort, within 20 minutes resort, we have no issues. [0:12:20.8] CM: Okay and are there future plans that you will try to get the resort to start sponsoring things like local education and all of those kinds of issues and more conservation and stuff? [0:12:31.7] JT: Yeah, that’s one thing that we like to do but you have to realize, I don’t spend a full year in Triton Bay. I spend a few months each year in Hong Kong and every time I’m in Hong Kong I think about what we can do in the future and I’ve got all these big fancy plans and I get here and I get really busy with the day to day operation of the resort and nothing gets done. But you have to realize for anything to get done in this part of the world, it takes a lot of time. It takes a lot of time so even if I wanted to get something done, it will take me a year, two or three years to get something done probably three or four times longer than anywhere else. So yeah there are a lot of plans but it’s going to take a lot of time. [0:13:10.2] CM: Sure. Are you a co-founder or are you the founder of the resort? [0:13:14.8] JT: Lisa and I are co-founders of the resort, Lisa English. [0:13:18.1] CM: Okay and do you have many staff as well that help you in that high level in terms of outreach to the different families and so on? Or is it basically just you two figuring everything out? [0:13:28.9] JT: In terms of dealing with the family, it’s just me and Lisa dealing directly if that’s what you mean. We have a lot of family members, members of the family working for us like the boat drivers are all from the family. We have some ladies in the kitchen who are from the family but it’s mostly me and Lisa interacting with them. [0:13:46.2] CM: Okay and for anyone who’s listening to this and thinks, “Well I want to come to Triton Bay,” What would you say is your own personal favorite dive site here? [0:13:58.1] JT: I am more of a wide angled person. I like lots of fish, I like soft corals. For the pure amount of fish the two fishiest site might be Stumpy Rock in the north and Dramai in the South. However, you are talking about fish per square meter of coral, Little Komodo I don’t think can be beaten. Little Komodo is actually a really small dive site. You can’t fit many people on it and you get so many fish in that little area. But you have bigger sites like Stampi or bigger sites like Dramai and they are much, much bigger but you have so much fish there so it’s really hard to say. [0:14:33.3] CM: And so if someone was going to come, and wanted to come and stay with you, typically to people come and stay for a week something like that or do they typically stay longer maybe? What’s the general mode of operation? [0:14:44.0] JT: I would half of the visitors stay for a week and half stay for two weeks but really if you go and if you are traveling from Europe or the US and you come here for just a week, you’re hitting the dive sites, each of the main dive sites once so you don’t really see it and if you happen to hit one of the sites on a bad day, you don’t really get to see much. So I would say, if you really want a complete experience, I think a minimum two weeks. [0:15:08.5] CM: You just said, you’d only hit each the main sites once, so that means you’ve got at least 10 or 15 sites that you think are key that should be seen. [0:15:16.3] JT: Yeah, we have about 10 to 15 primary sites and maybe five to 10 secondary sites and another five or 10 tertiary sites so if 30 to 40 sites, a lot of the area hasn’t been explored, a lot of sites we’ve only done once or twice in two or three years. There are some sites like Little Komodo that we do multiple times each week. [0:15:38.8] CM: Okay. How do people actually get to your resort? I mean, presumably they fly into Kaimana and then what happens? [0:15:44.4] JT: There’s a pickup at the airport and then a 20 minute drive to the harbor and a two hour ride in a speedboat. [0:15:50.3] CM: Okay, so by Indonesian standards out here, that’s pretty easy. [0:15:55.8] JT: That’s pretty normal. It’s very similar to Raja. [0:16:01.2] CM: Awesome. Well, Jimmy, thank you very much for telling all about Triton Bay Divers and where can people find you online if they want to get in touch? 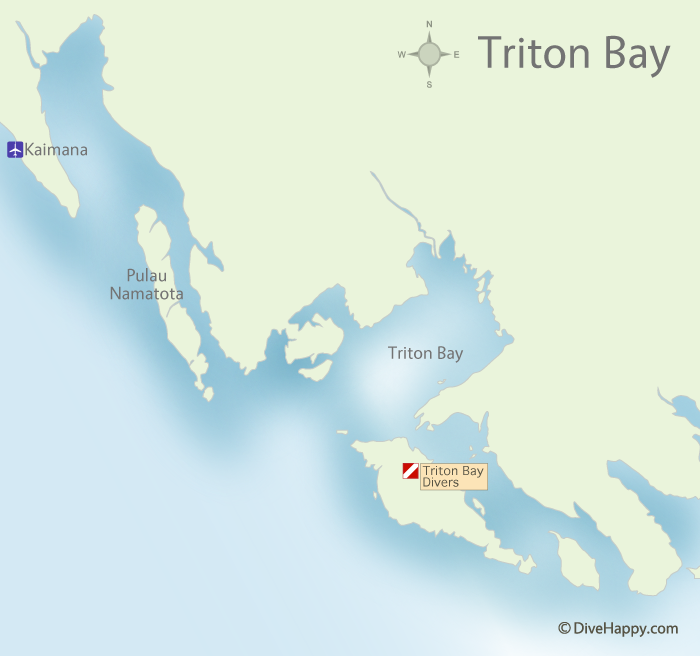 Triton Bay Divers is the first and only resort located in the Triton Bay area of West Papau, Indonesia. Together with the Kamakaula family, the resort founders, Jimmy and Lisa, have created a partnership. The Kamakaula family are the owners of most of the land around the island of Aiduma and they have lived there for generations. Ultimately, the long term success of this project depends on having the local community fully supporting the resort, and the best way to achieve this was to bring them on board as partners. Jimmy and Lisa’s purpose, together with their Papuan partners, is to promote eco-tourism in order to sustain the local community, to help educate and spread awareness of global issues, to share a small peace of paradise with the world, and preserve it for future generations. For a long time, Jimmy always knew that he wanted to do something dive related in his lifetime. After doing a lot of research he found out that Indonesia was the clear choice when it comes to diving locations. For Jimmy, he did not want to go to a place that was already heavily toured and filled with liveaboards and dive resorts. He also knew that there had to be great diving to attract others with whom he could share this incredible space. Along the Bird’s Head Seascape there were only two places that he had in mind, Cenderawasih or Triton Bay. Eventually Jimmy came to realize that Triton Bay had incredible diving and knew it would give him an incredible opportunity to build a resort. At the moment, Triton Bay is really like a niche location. Despite the amazingly rich underwater life, it is probably not the best location for a beginner diver because it is difficult to know and understand what you are looking at when you are just starting out. The first thing to realize with Triton Bay is that, because of how rich it is in nutrients, the visibility is quite poor. However, these rich nutrients in the water actually feed the coral and that is why Triton Bay has such bountiful soft coral and why there is so much fish life. It is truly a give and take. You will not have the 40 meter visibility like you do in Thailand, but you will have a lot more fish and a lot more coral. For quite some time now, the bagans in the area have attracted whale sharks, which is always a must-see for guests who come to dive in Triton Bay. Since problems with the village in control of the bagans have been cleared up, sightings of whale sharks have been consistent throughout the last season. They are being seen 70 to 80% of the time. Traditionally the whale sharks are only in the northern bagans near Mai-Mai, but within the last few months, they have been seen at the south bagans by Namatota. This has really increased the odds of seeing the whale sharks because there are now a lot of bagans to choose from. The closest airport to the Triton Bay Diver’s Resort is the Kaimana. From there, it is a 20 minute drive to the harbour and then a two hour ride on a speedboat before you reach the resort. Most often times, divers come or either one or two weeks. Jimmy recommends staying longer because there are at least 10 to 15 primary sites, five to 10 secondary sites, and another five or 10 tertiary sites to visit. So in a two week period, there is really not a lot of time to hit all the sites, especially if you bump into some unfavourable weather.